Initially known as a teen idol thanks to his role on 21 Jump Street and tortured pretty-boy looks, Johnny Depp survived the perils of adolescent heartthrob status to earn a reputation as a respected adult actor. 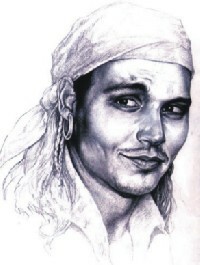 His numerous collaborations with director Tim Burton, as well as solid performances in a number of critically acclaimed films, have allowed Depp to carve a niche for himself as a serious, if idiosyncratic performer, a real-life role that has continuously surprised critics intent on writing him off as just another photogenic Tiger Beat casualty. Born in Kentucky and raised in Florida,Depp had the kind of upbringing that would readily lend itself to his future portrayals of brooding lost boys. After his parents divorced when he was 16, he dropped out of school a year later in the hopes of making his way in the world as a musician. Depp fronted a series of garage bands; the most successful of these, The Kids, was once the opening act for Iggy Pop. During slack times in the music business, Depp sold pens by phone. He got introduced to acting after a visit to L.A. with his former wife, who introduced him to actor Nicolas Cage, who encouraged Depp to give it a try. The young actor made his film debut in 1984's A Nightmare on Elm Street (years after attaining stardom, Depp sentimentally played a cameo in the last of the Elm Street series), and his climb to fame was accelerated in 1987, when he replaced Jeff Yagher in the role of undercover cop Tommy Hanson in the Canadian-filmed TV series 21 Jump Street. Biding his time in "teen heartthrob" roles, Depp was first given a chance to exhibit his exhausting versatility in the title role of Tim Burton's fantasy Edward Scissorhands (1990). Following the success of Edward Scissorhands, the actor made a conscious and successful effort never to repeat himself in his subsequent characterizations. He continued to gain critical acclaim and increasing popularity for his work, most notably in Benny & Joon (1993), in which he played a troubled young man who fancies himself the reincarnation of Charlie Chaplin and Buster Keaton, and What's Eating Gilbert Grape (1993), which cast him as its title character, a young man dissatisfied with the confines of his small-town life. Following Gilbert Grape, Depp outdid himself in Burton's Ed Wood (1994), with his outrageous but lovable portrayal of the angora-sweater-worshipping World's Worst Film Director. The same year, he further exercised his versatility playing a 19th century accountant in Dead Man, Jim Jarmusch's otherworldly Western. With his excellent portrayal of the titular undercover FBI agent in Mike Newell's 1997 Donnie Brasco, Depp continued to ascend the Hollywood ranks. After a starring turn as Hunter S. Thompson's alter ego in Terry Gilliam's trippy adaptation of Fear and Loathing in Las Vegas (1998), Depp tried his hand at sci-fi horror with The Astronaut's Wife in 1999. That same year, he again collaborated with Burton on Sleepy Hollow, starring as a prim, driven Ichabod Crane in the remake of Washington Irving's classic tale of gothic terror. Appearing the following year in the small but popular romantic drama Chocolat, Depp jumped back into the big time with his role as real-life cocaine kingpin George Jung in Blow (2001) before gearing up for roles in the Jack the Ripper thriller From Hell (2001) and Robert Rodriguez's Once Upon a Time in Mexico (2002). In addition to his acting, Depp has also gained a certain dose of fame for his romantic involvements with several female celebrities, including Winona Ryder, Sherilyn Fenn, and Kate Moss, and in 1999 fathered a daughter with French singer/actress Vanessa Paradis. He was also the owner of the Viper Room, a popular L.A. nightspot which gained notoriety when actor River Phoenix died of a drug overdose on its doorstep in 1993. For more than a century, human beings have used engines to pull, push, or lift themselves into the air, and for the past two decades, Microsoft Flight Simulator has let armchair pilots explore the exciting world of aviation on their PCs. Microsoft Flight Simulator 2004: A Century of Flight commemorates this double anniversary by offering more planes, better graphics, and more options than ever before right out of the box, but the game will likely reach its full potential only if it receives great support from its player community. Fans of the previous games in the series will be up and running in no time thanks to the new game's familiar interface, but Flight Simulator 2004 also happens to be the most beginner-friendly game in the series. It's easier to access game options, and each option is actually explained by the game. There's also an excellent interactive flight school hosted by aviation veteran Rod Machado that serves as a surprisingly deep training tool. There is enough written material included about the planes, the history of flight, and flying tips to fill an encyclopedia. As such, Flight Simulator 2004 represents one of the rare instances in which online documentation is wholly superior to a printed manual. The documentation includes articles that are supplemented with Web-page-style hyperlinks, which lead to more detailed information about a particular topic. And you'll need all the information you can get, because most of the new planes in Flight Simulator 2004 are cranky old antiques that require your undivided attention. The entire history of civilian flight is represented in the game, from the original Wright Flyer that can't even struggle its way out of ground effect to a Boeing 747-400 that can haul hundreds of people higher than 40,000 feet at Mach .85. You can retrace Lindbergh's steps across the Atlantic in a re-creation of the Ryan NYP "Spirit of St. Louis," see what Amelia Earhart's trip across that same ocean was like in a Lockheed Vega, and haul freight over the mountains in a Douglas DC-3, among other things. The Sopwith Camel was not brought over from the previous game into the new game--this is strictly a civilian flight simulator, without any military prop planes or jets, but it still offers plenty of different aircraft to fly. The overall flight model feels very similar to that of Flight Simulator 2002 and is well suited to capturing the nuances of the game's slow and underpowered historical planes. Aside from the historical aircraft, Flight Simulator 2004's big news this time around is its weather effects. You can set up in-flight weather any way you like or go for the ultimate in realism by having the game automatically download real-world weather reports from the Jeppesen database every 15 minutes. Even if you don't choose to use the real-world weather option, the game can dynamically change its weather conditions so that a flight that begins in clear blue skies might end up in pure instrument conditions as you try to feel your way down to the runway in a violent thunderstorm. The addition of true 3D clouds that drift through the sky and merge into one another as weather conditions change adds a realistic touch to the game that static screenshots simply can't convey. Flight Simulator 2004's graphics are improved over those in the previous game, but they're not exactly photo-realistic just yet. Buildings still use low-resolution textures, and the ground looks much better from a high altitude than it does when you're flying low and slow. The game's interactive virtual cockpits are a great new feature, since the ability to control most switches, knobs, and dials with the mouse when the 3D cockpit is enabled adds some much-needed functionality to that view. Unfortunately, the textures used in the virtual cockpits are low resolution and very ugly--hopefully this is something that inventive computer artists among the Flight Simulator fan community will address. On the outside, the planes look beautiful, with vastly more-complex models adorned with gorgeous high-res textures that sparkle in the sun, and the game also sounds impressively realistic, since the developer recorded engine noises from actual planes for use in the game. They are hot…they are happening…they are the heartthrobs of the music scene in town. They are the prodigies who know how to rock people and get them on their feet in a flash. There's only one word to describe them- genius. They are simply…Nemesis. 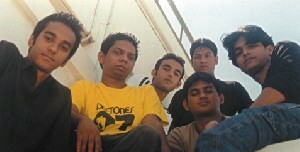 Now, one of the most coveted bands in Dhaka, Nemesis is now reaching for the stars if not already there. But what is Nemesis? How much do people really know about the faces behind the name? How much do they know about the people who made Nemesis? Very little. For some, almost nothing. But rest assured all you Nemesis fans out there, because RS just managed to get a one on one interview with Nemesis at band drummer Dio's house. All the members of the band: Zohad, Dio, Omayr, Yawar, Ratul, Nandito- except for lead guitarist Maher and special vocalist Nabila were present for the one-on-one with RS where they talked frankly about themselves, their experiences, their up-coming album and their rise to stardom (which by the way they claim is "we don't think we have mass popularity"). So here you have it people- Nemesis unmasked and unveiled- exposed. RS: When did the band start? NEMESIS: The band started in December 1999. RS: Who were the first members? 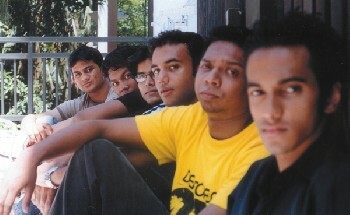 NEMESIS: The initial members of the band would have to be Yawar, Saber, Maher, Sabin, Faria and Fariza. RS: Of these initial members, who left, who remained and who came as new additions? NEMESIS: Saber left for USA. Sabin left as well. Faria and Fariza went off for their studies. Nondito, Zohad and Ratul joined during the second gig. Dio and Omayr came later in place of Nandito and Yawar (they study abroad). RS: Why did you choose the name "Nemesis"? NEMESIS: It was a spur of a moment decision. We were about to get up and perform and we needed a name. And we just came up with Nemesis. RS: What do you categorize yourselves as? NEMESIS: Ummm, we categorize ourselves as a Rock/Alternative band. RS: What type of music or what bands do you play? NEMESIS: We play (chorus) U2. Dire Straits, Guns And Roses, Pearl Jam, Creed, Satriani. And we'll soon be doing our own tracks. RS: Whom are you most inspired by? NEMESIS: We are inspired by each other, by Nemesis. (Ratul) Musically, I'm inspired by heavy metal- bands like Metallica, Iron Maiden. (Zohad) U2, Pearl Jam. (Nondito) Rock music. (Zohad) Maher is inspired by Satriani, Mettalica and Dream Theatre. (Yawar) Dire Straits, Santana. (Dio and Omar) U2. RS: Does the song "With Or Without You" (U2) have a special significance? NEMESIS: Actually, it was the first song we performed on stage and they loved it. RS: What led you to choose your individual areas of music? NEMESIS: (Zohad) I never knew I could sing. It happened coincidentally and I enjoyed it. (Yawar) I was just too lazy to play other stuff. (Nondito) I started off with drums but took up guitar. The guitar allows me to express myself creatively. (Zohad) Maher is just a natural genius. (Ratul) It just happened for me. (Dio) I don't know. Like him (Ratul) it just happened. (Omayr) Just happened for me too. RS: When did you first perform? NEMESIS: On Valentines Day in 2000 at Russian Cultural Centre. RS: When you started out, did you ever predict this mass popularity? NEMESIS: Well, we never expected mass popularity. We don't think we have mass popularity. But the fans have been great and we are grateful to them for it. RS: Does the fact that you're labelled with other underground bands bother you? NEMESIS: No it doesn't bother us. It's like a family and it's great being a part of it. RS: Did you participate in Benson & Hedges? RS: Did you win? If no, were you disheartened? NEMESIS: No we didn't win. We weren't disheartened because we had started out maybe two-three months ago and we just wanted to perform. We didn't want to win. We were doing everything. Going to whatever shows we could. We were in the growing process and we never had any aspirations for it. RS: When are we going to see your own album? NEMESIS: We're working on it. (Zohad) Somewhere in 2004. RS: Who are going to perform in it? NEMESIS: Everyone is. Everyone who is a part of Nemesis. There's also our guest performer Nabila. She's actually a member. She's our permanent guest vocalist. RS: Will you have both English and Bangla tracks? NEMESIS: Yeah. We'd prefer to have all English songs but the label requires us to have Bangla tracks. RS: Who did the composition and lyrics? NEMESIS: Everyone. It was a united group effort. RS: Does the overwhelming number of female fans bother you or your private lives? NEMESIS: I think Zohad has something to say…. (Zohad laughing out loud) No it doesn't bother us. Actually it's very flattering. RS: Have your expectations as musicians been fulfilled by now? NEMESIS: No definitely not. We have a long way to go. RS: Do you all plan to make a professional career out of this or is it just a temporary phase that you will eventually abandon? NEMESIS: We would love to. But we don't know what will happen. We don't know what the future holds for us. We would love to be professional musicians. RS: What do you want to say to all your fans out there? NEMESIS: It's a beautiful day. Thank you for making it a beautiful day for us. Thanks for the support. Rock on! So there you have it! All you need to know, all you wanted know and all you didn't know! Till their next concert and the launch of their very own album- hats off to Nemesis! You guys simply rock! Johnny Depp's latest movie Pirates of the Caribbean turned out to be a sweeping blockbuster this summer. In just three weeks, the movie grossed 200 million dollars in USA. And the trend remains so strong that it seems that the movie might gross 300 million dollars and exceed the success of Matrix reloaded and X-2. The Walt Disney movie set in the Caribbean Sea in the 17th century, tells a story of a gentleman rogue of a pirate, Jack Sparrow (Depp), who teams up with the daughter of a governor to stop the evil plan of a ship of dangerous pirates who are trying to reverse an ancient curse that leaves them stuck between life and death, with the light of the moon revealing their skeletons, like some kind of undead monsters. Computer games addicts may recall, this story amazingly resembles the adventure game series of Lucas Arts titled Monkey Island (four games released since 1991 remain as best selling and influential humor adventure games). Whatever, Pirates of the Caribbean stands out as a must-see movie this year. The upcoming set will be AC/DC's last for Elektra. 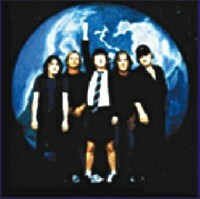 Subsequent studio albums will be issued by Epic, which has recently reissued AC/DC's entire catalog. AC/DC has planned to make a March show in New York its only live appearance of the year, but wound up opening a series of shows in Europe for the Stones. "We've been going at it for a while and you get intense at it, but sometimes you just have to come up for air too," Young says. A&E will debut documentaries this fall on Paul McCartney and Sting. "Paul McCartney: The Journey to Red Square" is a two-hour program about the former Beatle's first Russian concert, which took place in May. McCartney executive-produced the special. The program will include footage of his Moscow concert and his visit to the Russian city of St. Petersburg, where he received an honorary doctorate from the Russian Conservatoire. “Sting: Sacred Love" chronicles the making of the veteran rocker's latest A&M/Interscope album, as well as performances of the new songs at his Malibu, Calif., home and Los Angeles' Mayan Theatre. There will be an accompanying "Sting: Sacred Love" DVD to be released on a date to be announced.